Couture Shirt Designs from "The Art of the Disney Princess"
In a couple earlier posts we saw a bit of artwork and photography found in the 2009 book The Art of the Disney Princess. 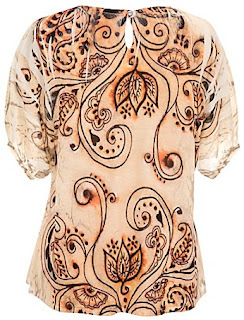 Today it's a look at those pieces that have inspired shirt designs. 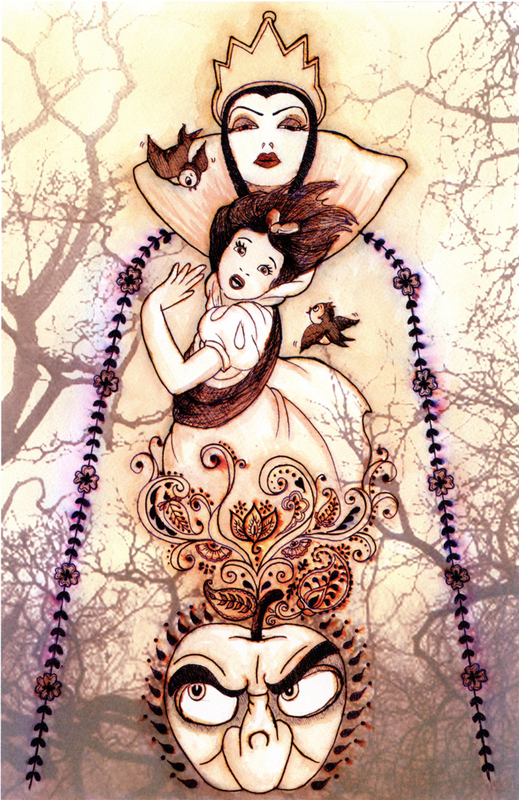 Snow White pen, watercolor and digital media by artist Regina Alphonso, p.130. Snow White digital media by artist Matt Cruickshank, p.103. 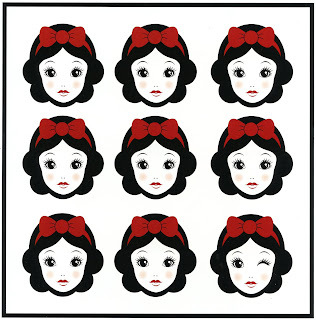 Snow White digital media by artist Patryk Poslednik, p.117. 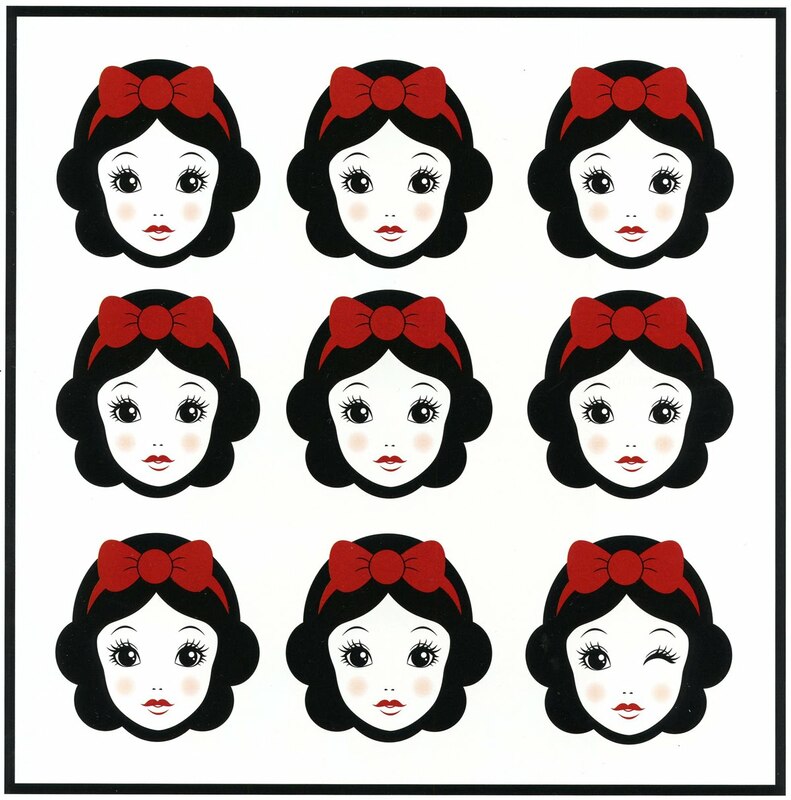 Snow White digital media by artist Jenny Chung, p.86. 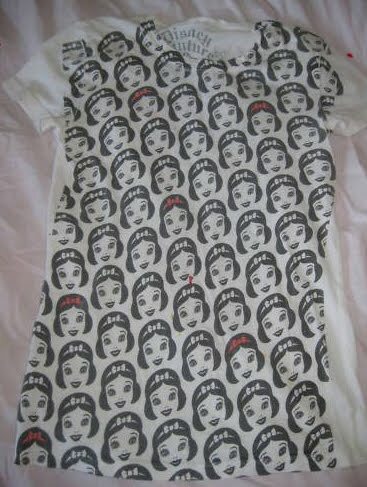 Snow White Disney Couture Tee, 2010. 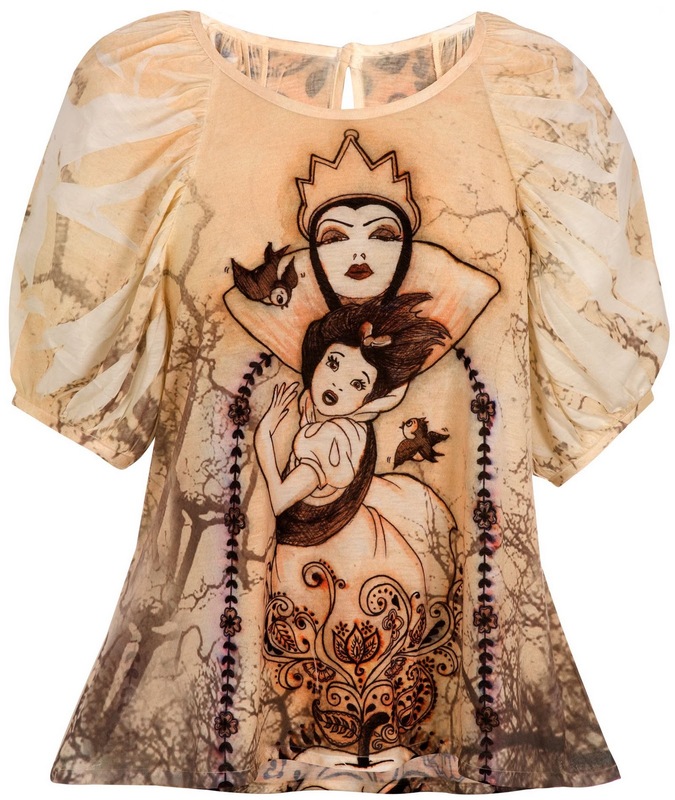 Snow White Dolman Sleeve Rhinestone Top. 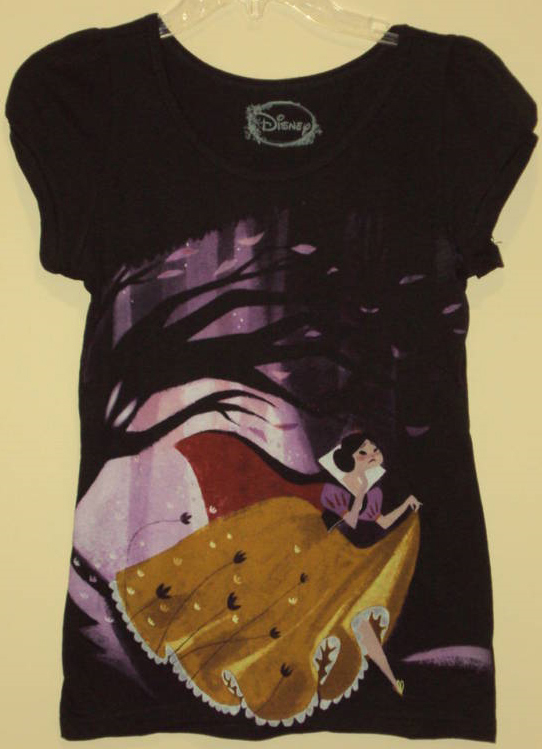 Currently available at disneystore.com. 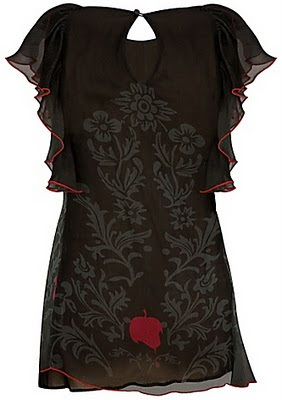 Retail $69.50. Snow White watercolor, gouache and ink on watercolor paper by artist Rebecca Wong, p.115. 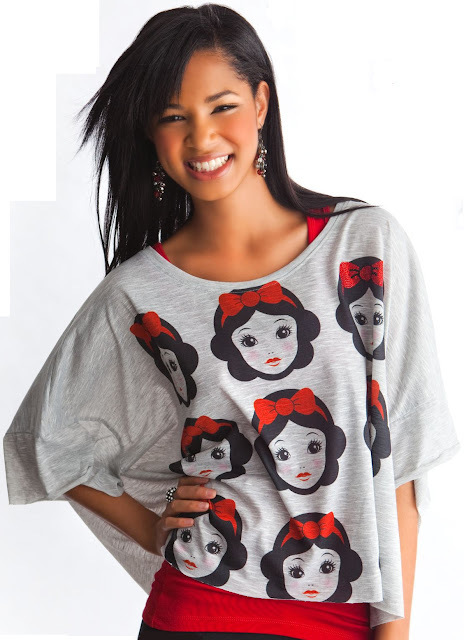 Snow White Dolman Sleeve Top by Disney Couture. 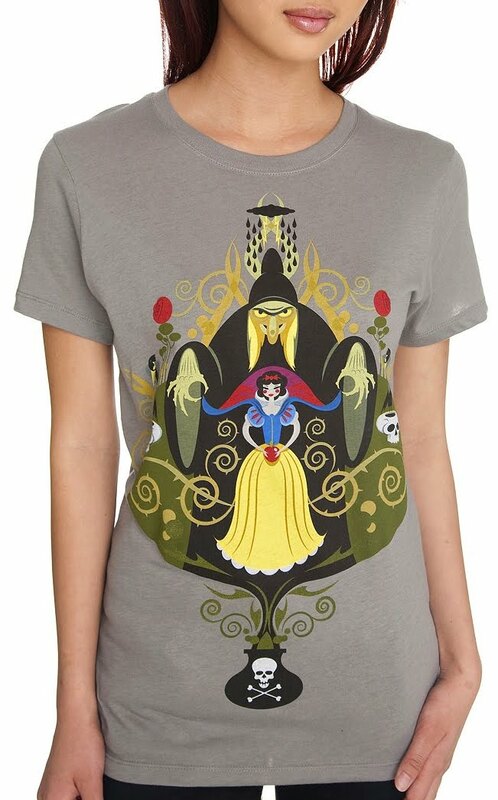 Currently available from disneystore.com $69.50. 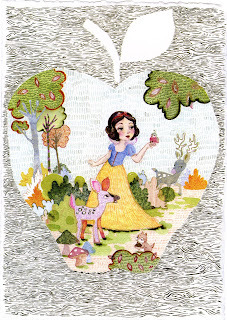 Snow White mixed media by artist Genevieve Godbout, p.68. Fitted layered rayon top. 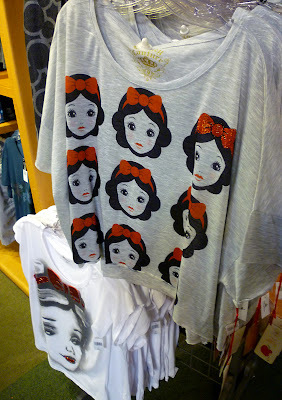 Disney Store Retail $39.95. Sold out. 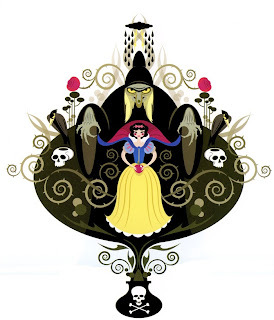 See more from The Art of the Disney Princess in a later post featuring the Snow White sculpt by artist Margaret Leahy. 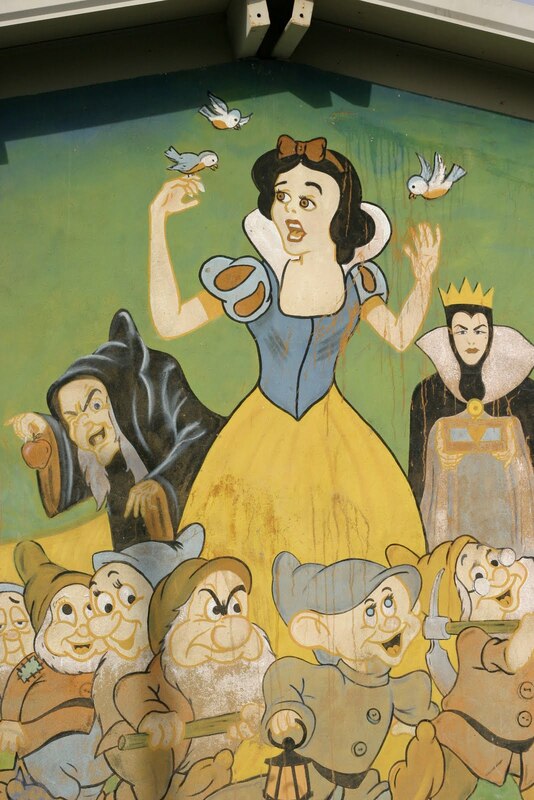 Snow White Mural, Tijuana, Mexico. Image copyright NathanGibbs. 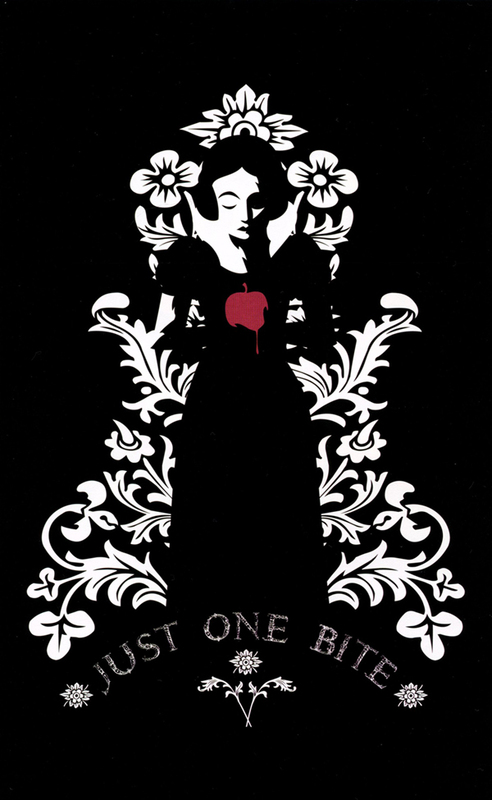 Creative Commons License. 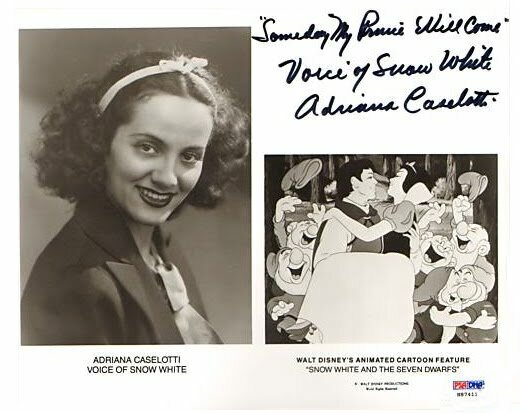 Adriana Caselotti's showstopping "Some Day My Prince Will Come" is one of the many touching highlights from Snow White. Composed by Frank Churchill with lyrics by Larry Morey, the song is ranked #19 on the American Film Institute's list of the 100 greatest songs in movie history. Over the years, the tune has been performed by both jazz and pop artists alike. 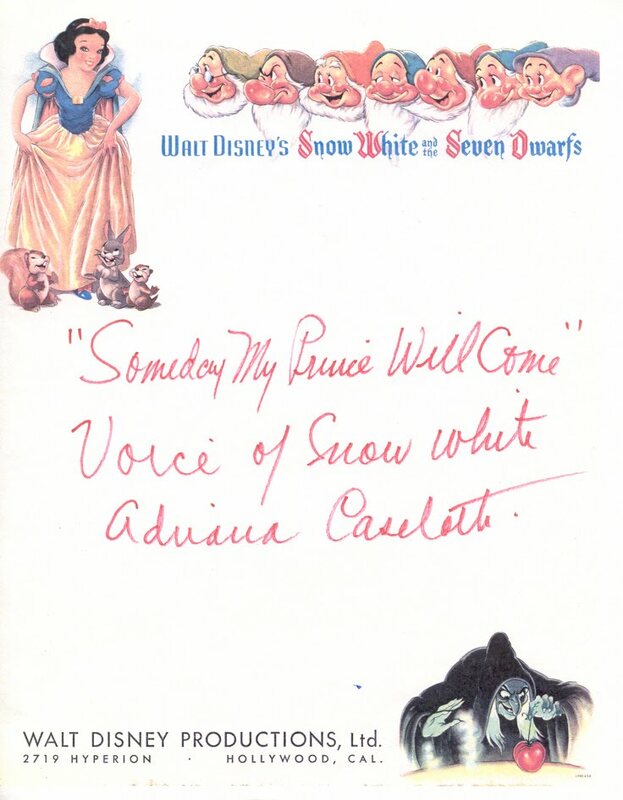 First covered by the Dave Brubeck Quartet in 1957, the American jazz pianist was inspired to record the song for his Dave Digs Disney album after hearing the original on one of his kid's Disney records. Other jazz greats followed including Miles Davis whose 1961 arrangement included a sax solo by John Coltrane. Modern day recordings continue like that of Venetians Radu and Violeta Zaplitnii. Pop covers include Diana Ross and The Supremes (1967), Sinéad O'Connor (1988), Tanya Tucker (1996), Barbra Streisand (2001), Tiffany Thornton (2009) and quite a number of others. 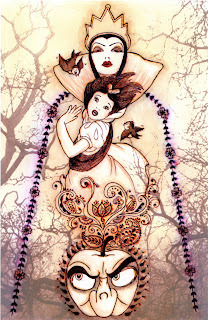 Some are welcome renditions of Adrianna Caselotti's original. Others nearly make me ill. But who am I to judge? 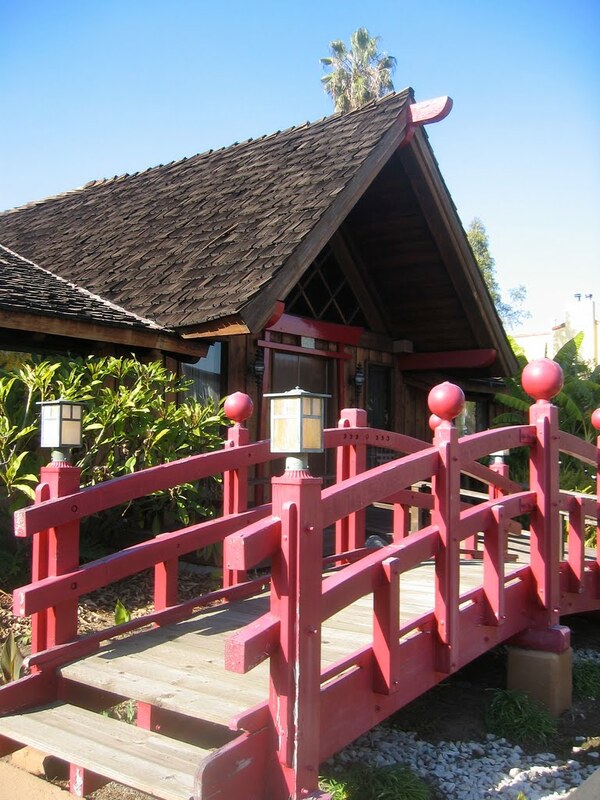 Performed by Dave Brubeck Quartet. Video posted by daalmelo. Performed by Miles Davis, John Coltrane, et al. Video posted by elnapoli. Performed by Radu e Violeta Zaplitnii. Video posted by neboske. Performed by Linda Ronstadt. Video posted by planetlove71. Performed by Barbra Streisand. Video posted by StylishlyDemented. Performed by Ashley Tisdale. Video posted by Pinkgirlie1995. Performed by Cheetah Girls. Video posted by wiishup0nast4r. Performed by Tiffany Thornton. Video posted by DisneyChannelUK. I always draw two identical pictures, so the person can keep one. I generally always draw older people because I've always found them more interesting subjects (and they're more likely to respond). I would say my favorite ones are the people who aren't necessarily "celebrities" but circumstances caused them to be in the right place in the right time to have a place in History. From his blog Darren's Celebrity Drawings. 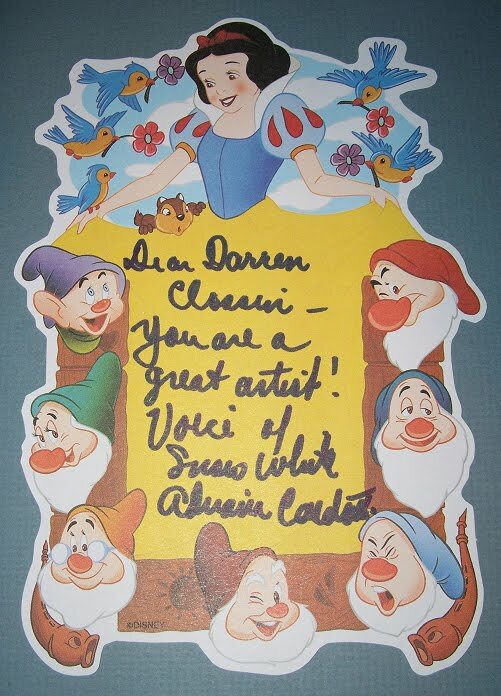 On this particular occasion, Darren drew a scene from Snow White and the Seven Dwarfs which he completed on October 23, 1996. 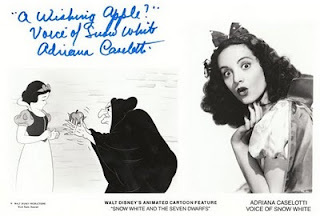 He mailed the two drawings off to Adriana Caselotti in hopes of having her sign one. Darren Clossin drawing autographed by Adriana Caselotti. I figured what the heck, she's 80, I may as well. So I sent her $60, her fee for signing both drawings. She signed both of them, and also sent me a nice note on Snow White stationary, and a signed photo for free! 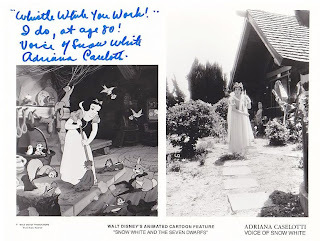 Sadly she passed away just two months later at age 80...I was glad I ended up paying her to sign them.From Darren's blog post. Adriana developed lung cancer in 1996 and died of respiratory failure on January 19, 1997. Darren's drawing would have been one of the last autographs she ever signed. Darren's 8x10 and Snow White Stationary autographed by Adriana Caselotti. All images used with permission. Graham Clipson runs the Autograph Collectors Gallery in Nottingham, England. In a recent email, he shared with the Filmic Light how he had spoken with Adriana many times. "She used to sing over the telephone to us a few years before she passed away. I have many signed photo's of her as she said, 'I won't last forever.' A delightful lady." Below is a letter dated November 4, 1994 from Adriana to the Clipson in regards to an order of 51 signed photos. Later in her life, Adriana Caselotti became a prolific autograph signer and usually sold them to help supplement her income. 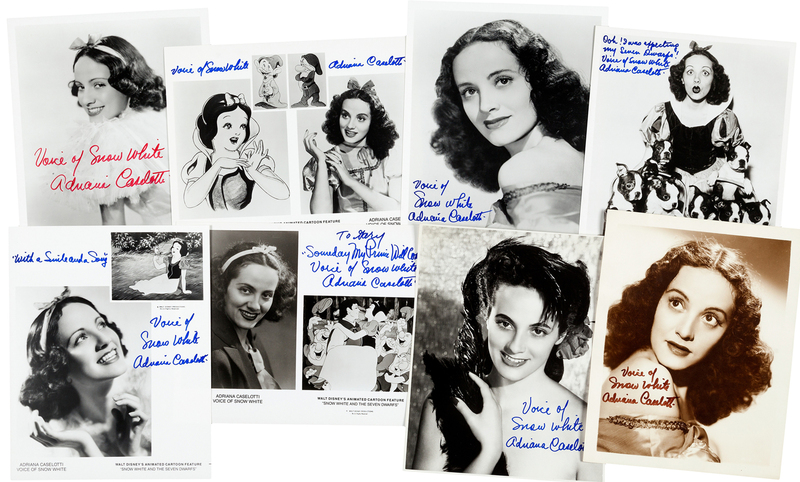 Most of the signatures below are on 8x10 black and white glossy photographs. 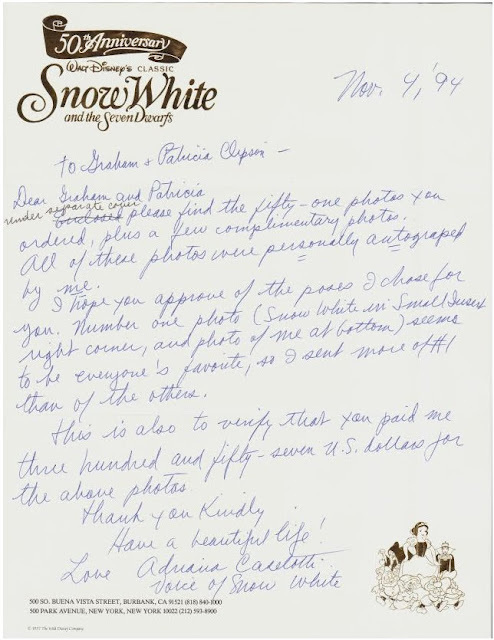 In the next post, read a letter written by Adriana to one of her good autograph customers. A boss with a vision. Hundreds of multi-talented artists at the ready. And a project the likes of which had never been seen before. 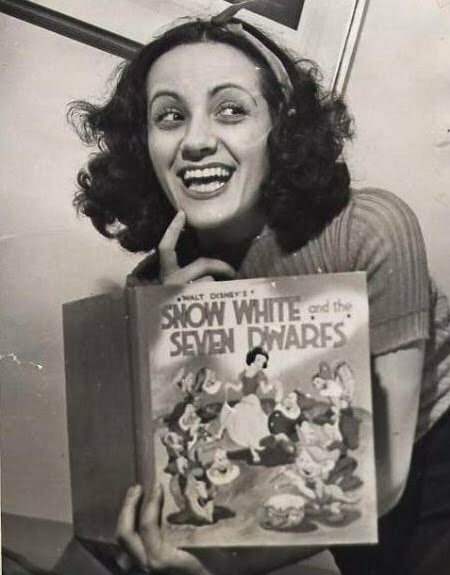 Nothing short of monumental was the collaborative effort put forth by the men and women who made Snow White and the Seven Dwarfs. 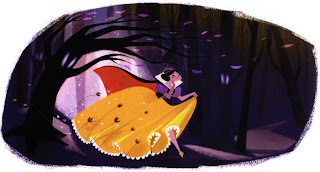 Fans and animation historians today can easily rattle off a throng of celebrated names whose creative and dedicated labor contributed to the massive success of the film. 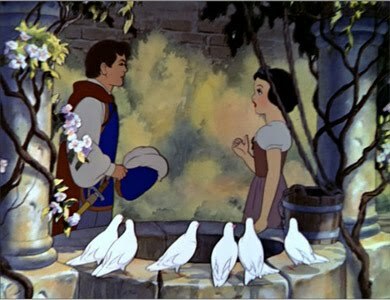 The animation was stunning, the multiplane photography innovative, and the music composition sublime. Walt Disney made sure that the story was tight as a drum. Yet, the crowning stroke was his choice for the lead. Adriana Caselotti as the voice of Snow White was the perfect "icing" on this awe-inspiring "cake". 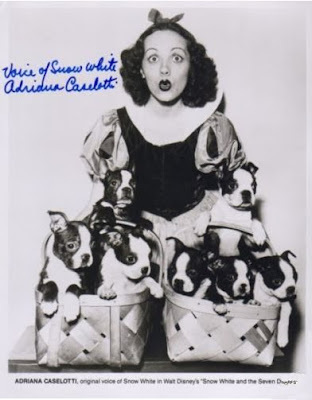 Caselotti was born in Bridgeport, Connecticut, May 16, 1916 to a very operatic family. 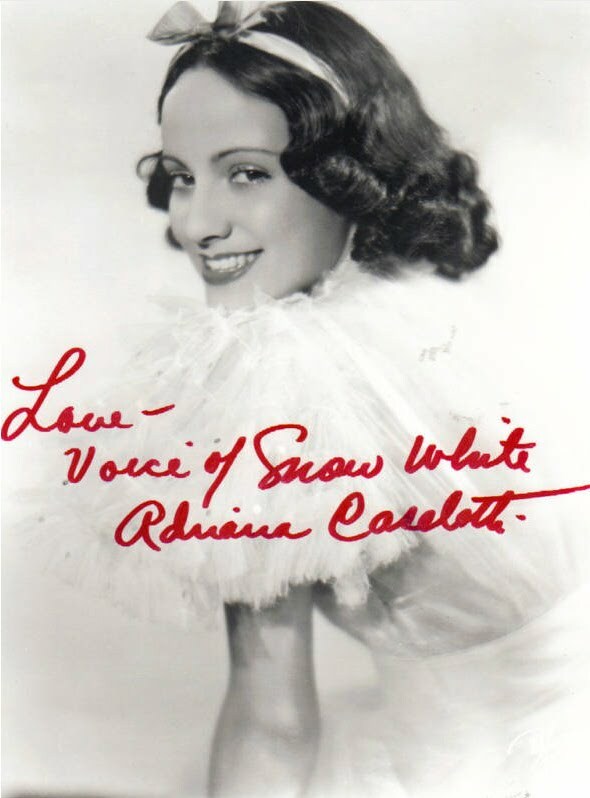 "Her father Guido, an immigrant from Italy, taught music in New York City, her mother Maria (from Naples) sang at the Royal Opera, and a sister Louise was a noted opera singer and voice teacher." SOURCE: IMDb. 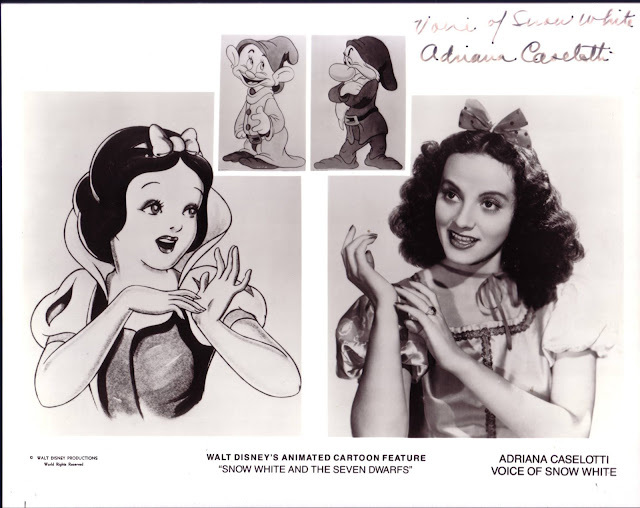 Adriana received her formal schooling at a convent near Rome while her mother sang in the Opera. Upon returning to America, her father trained her in the art of hitting those high notes. 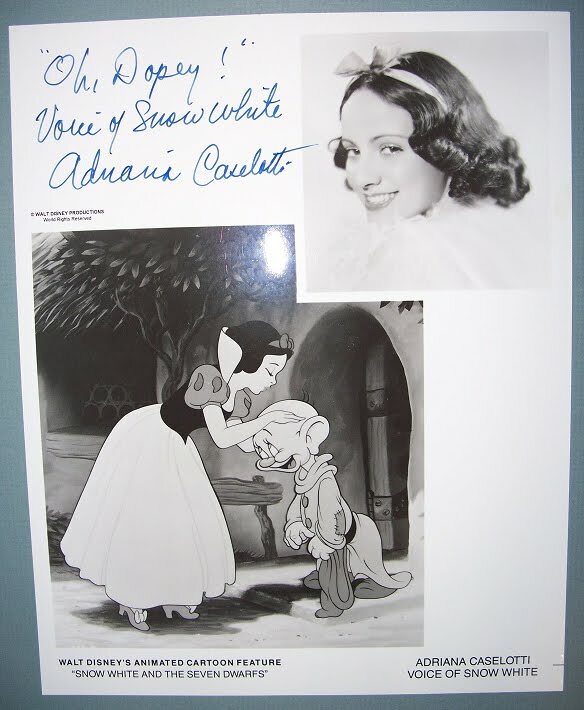 Authentic Autographed Adriana Caselotti 8x10 courtesy of Brian Sibley (signed in his presence). 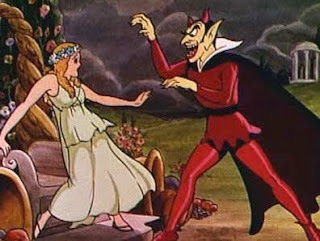 As Hollywood looked to expand its use of this new technology called "sound", the early 1930s saw operetta being incorporated more and more into motion pictures. MGM's The Merry Widow and Disney's own Silly Symphony The Goddess of Spring were two such projects released in 1934. Snow White--already in development during this period--would feel their influence. 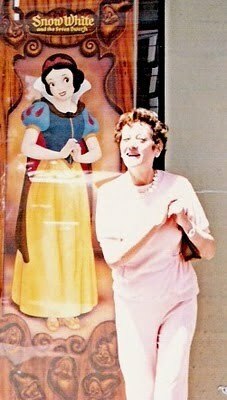 Walt knew that finding the right voice for his heroine would be critical to the charm and success of the movie. Snow White more the anything was the embodiment of innocence. The actor who played her must exhibit this vocally. 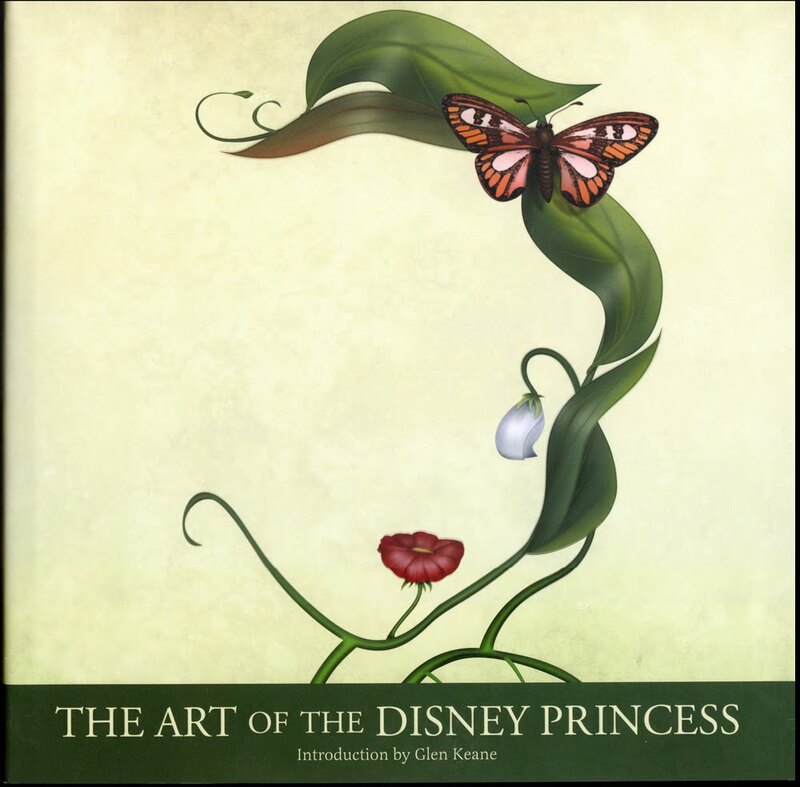 So important was this quest to find the perfect lead that more than 150 girls had already auditioned for the part. 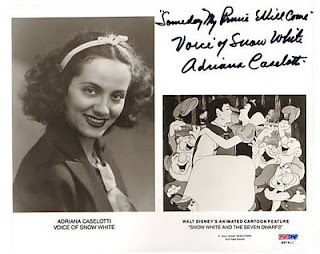 It was then that Guido Caselotti, now working as a vocal coach in Los Angeles, got a call from Roy Scott, a Disney talent scout. The story of how Adriana listened in on the extension to her father's conversation is an oft-repeated Snow White anecdote. When Scott asked Guido if he knew of any young singers that might fit the role, she immediately chimed in with a recommendation of herself. 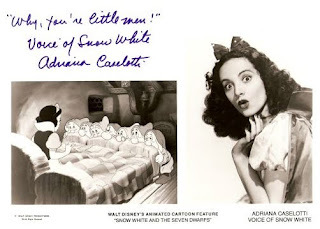 Hearing that Walt Disney was looking for the voice of a younger girl, Adriana--19 at the time--sang and spoke into the phone with her now familiar operatic child-like intonation. Her embarrassed father told her to get off the line but not before Scott had invited her to come to the studio for an audition. Walt Disney Studios 1926-1940. Image via Floyd B. Bariscale. 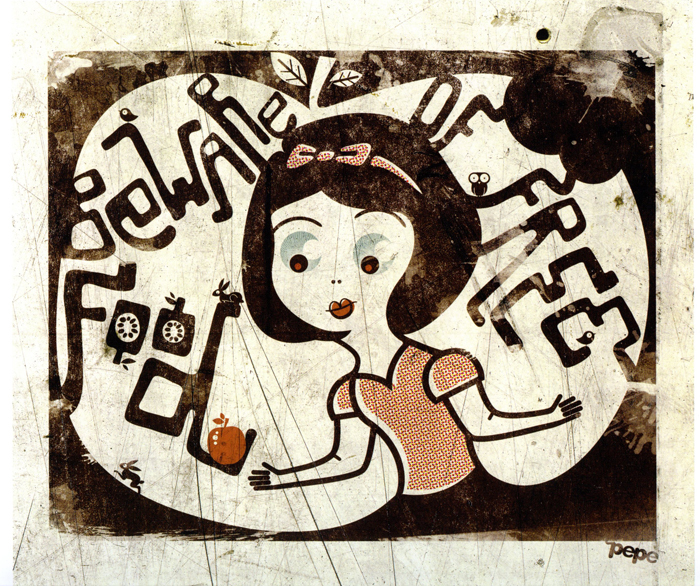 Creative Commons License. Candidates for the title role would be brought into the sound stage where they'd sing and read lines for the casting director. 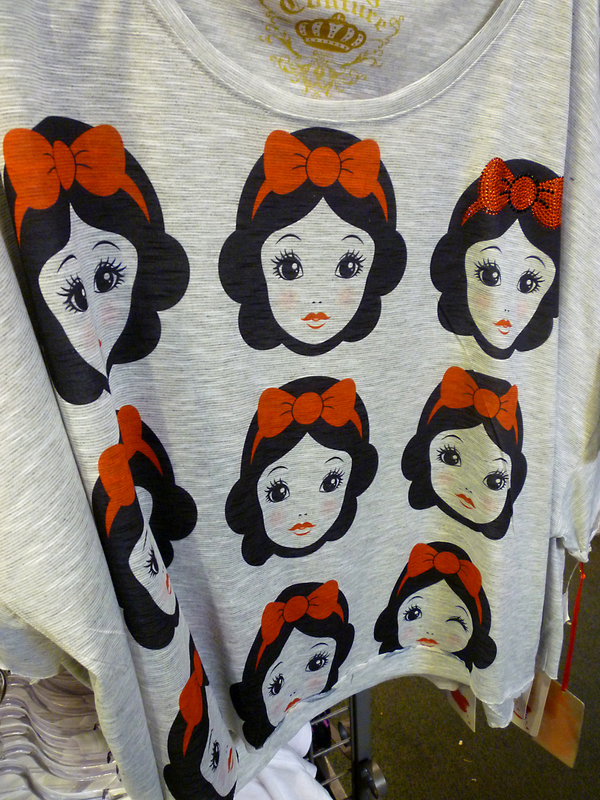 If the girl seemed promising, Walt would be paged to come hear the voice for himself. Not wanting to be influenced by the appearance of the girl, he had a wire run to his office near the stage so he could listen in on a speaker without having to see what she looked like. When Adriana performed, Walt knew she was the one. "That's the girl! 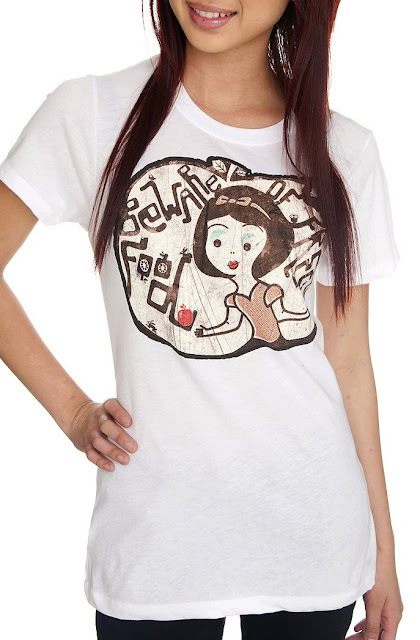 That's Snow White!" The search was over and the contract signed. 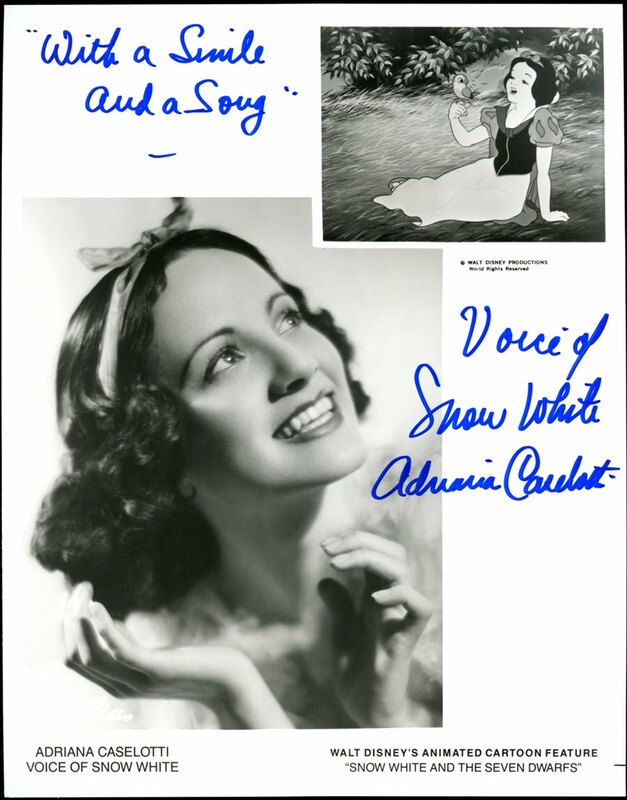 Adriana started recording on January 20th, 1936. She was paid $20 a day for 48 days of recording. Her total take home salary was $970. During the sessions, she continued to speak and sing her lines in what she considered to be the voice of a 14 year old, "but I never told Disney that. He never knew." 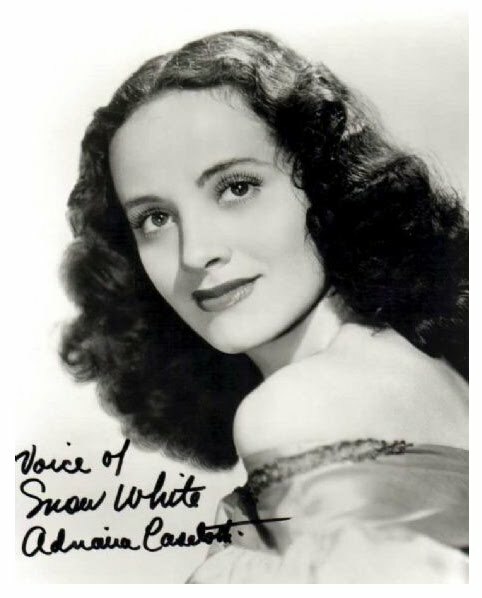 There was no one to play off of when doing her lines and no musical accompaniment for her singing (except for Frank Churchill plunking away with one finger on the piano). She had to carry it all on her own which she admitted was not always easy. 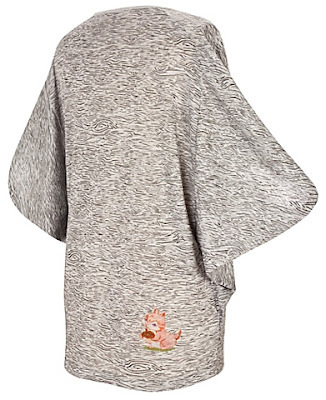 One of the lines was, "Grumpy. I didn't know you cared". Instead of that I couldn't get the DNT at the end of didn't. I would say "din". We rehearsed this thing over and over again and Walt said, "Listen, you're going to have to put this thing in there". So I tried again--fine in rehearsal and came the take. I still got it wrong and Walt said, "Oh, the hell with it". And it's still there. 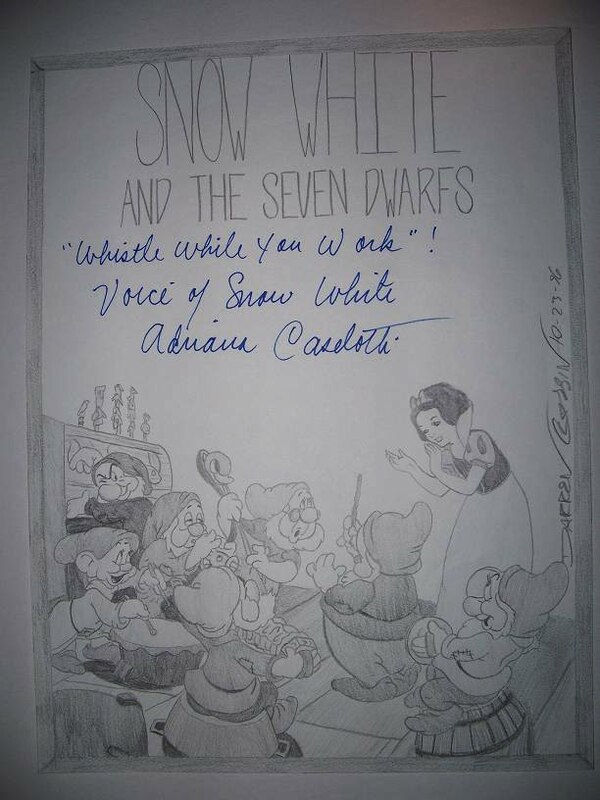 SOURECE: Walt Disney and Europe by Robin Allan, p.41. 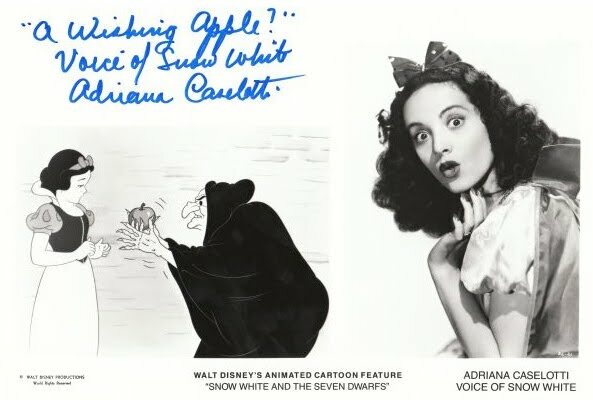 Adriana breathed life into the title character and imbued Snow White with the endearing qualities of innocence and grace. Just what Walt was looking for. 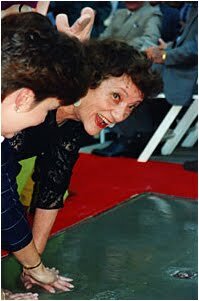 It's difficult to imagine the film without her. 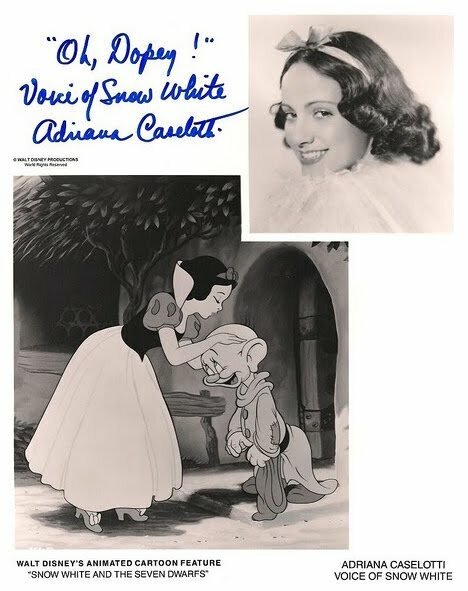 And yet, it's interesting to note that at the 1937 Carthay Circle premiere, she was not considered to be one of the invited guests. The main artists and animators were given tickets, but apparently the voice actors were not. This didn't stop Adriana. She showed up with Harry Stockwell, the voice of the prince, on her arm. 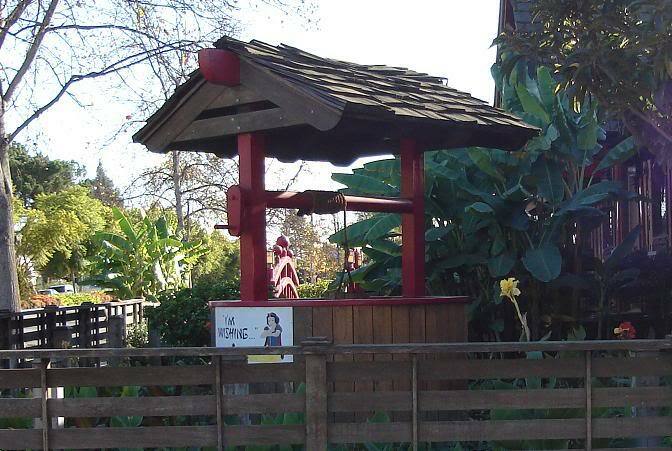 When they reached the ticket booth, they were told by the attendant that their names were not on the list. 'Tickets? 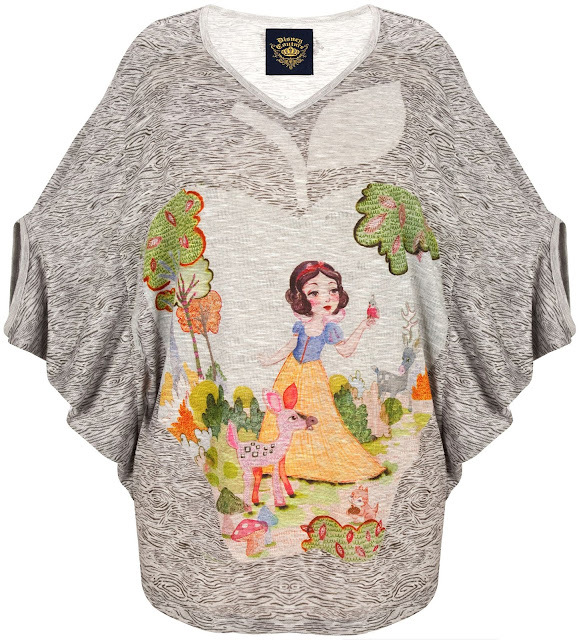 We don't have any tickets--I'm Snow White and this is Prince Charming! '* The attendant, of course having no idea who these two were, refused their request. 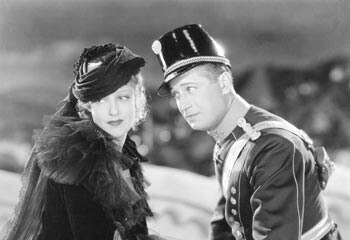 The two stars of the film stepped aside and waited until no one was looking. Then quietly they slipped upstairs to one side of the balcony to watch the movie. 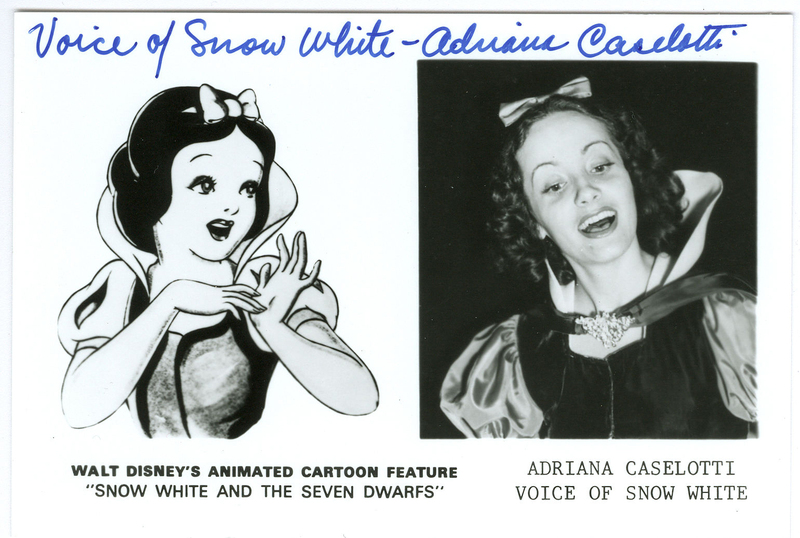 * SOURCE: Snow White and the Seven Dwarfs--The Making of the Classic Film by Brian Sibley and Richard Hollis, pp. 35-36. 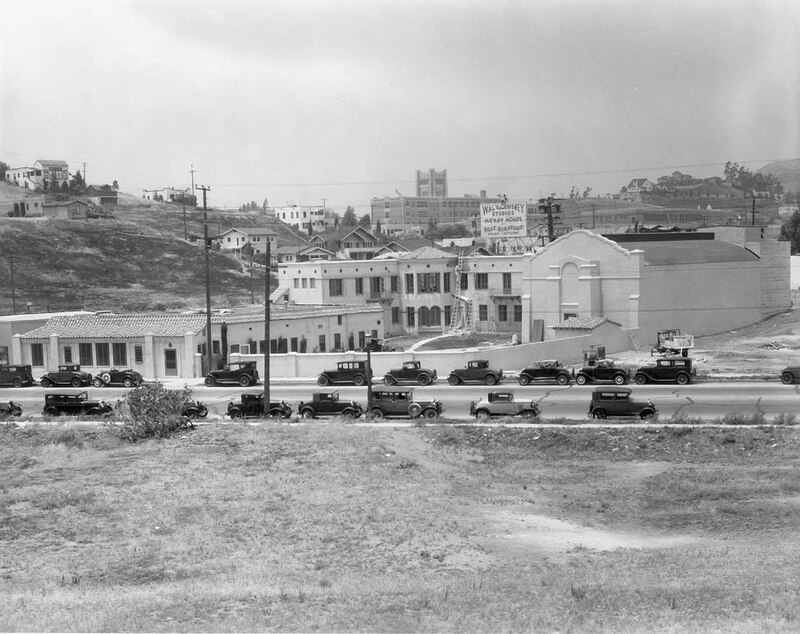 It was the Golden Age of Hollywood and a time when studios held contract over their actors. Walt owned Caselotti's voice. 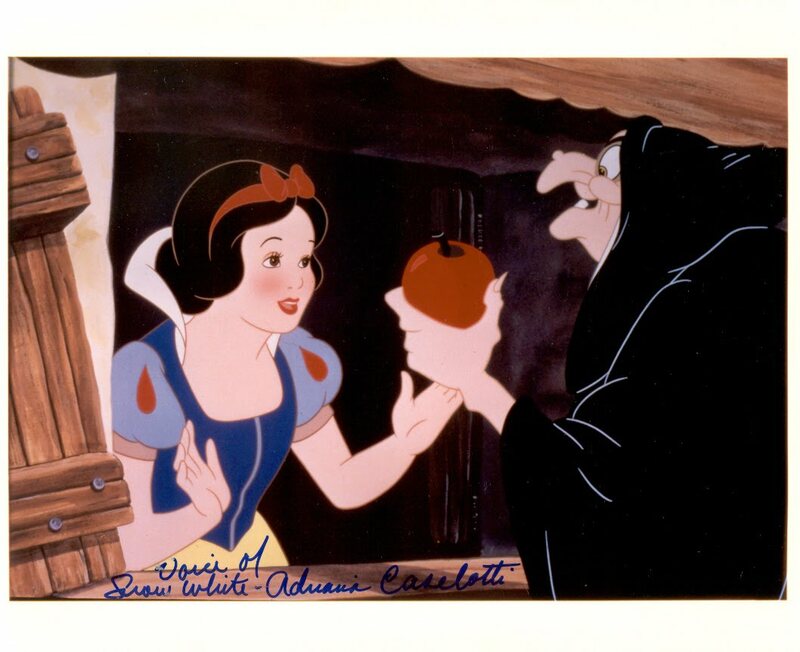 Not wanting to spoil the illusion of Snow White, he prevented her from working in other films or even appearing on radio shows. Except for a vocal bit part in The Wizard of Oz (1939) and an uncredited performance as the singer at Martini's bar in It's A Wonderful Life (1946), Adriana would never really work in motion pictures again. Later in life, Adriana was to say that she may have only received $970 for her role, but it really didn't matter if she ever got a penny. She was just grateful for having the opportunity of being part of this great film. Actively involved with many of the re-releases of the motion picture, including the 50th Anniversary in 1987, Adriana would appear on radio, in television specials, and at other publicity events. 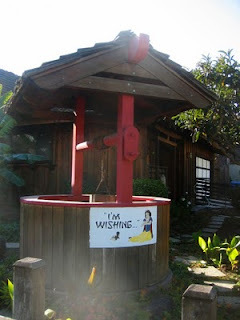 In 1983, she was asked to re-record the I'm Wishing song which plays at Disneyland's Snow White's Grotto. Read more about this in another post. (Left) Adriana poses next to Snow White poster outside Mann's Theatre in Hollywood, 1987. 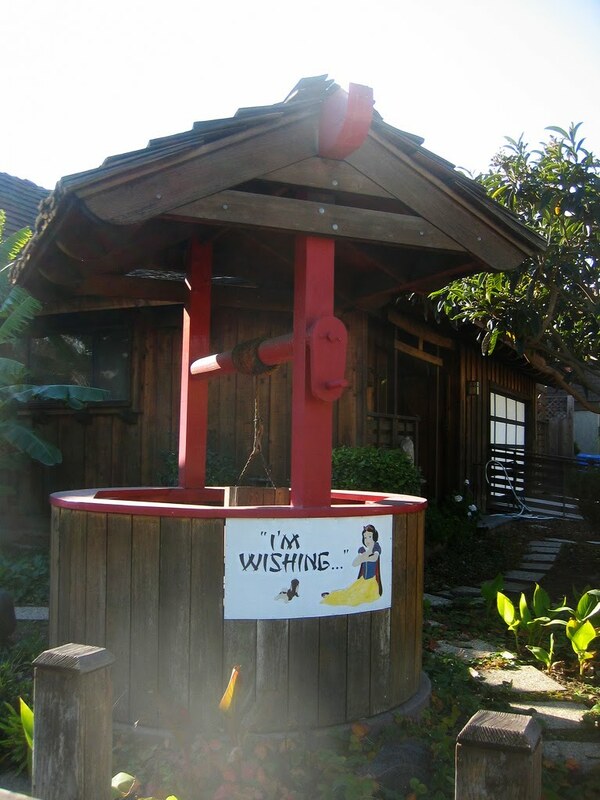 Adriana embraced her Snow White persona even to the extent of having a full size Wishing Well built in the front yard of her Beverly Hills home. 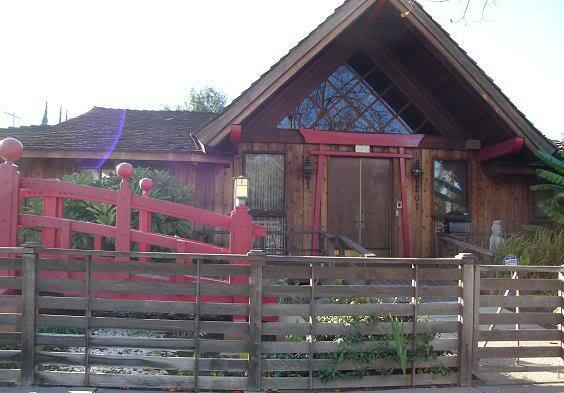 Located at 201 S. Larchmont Blvd., the house contained Snow White figurines and other memorabilia. 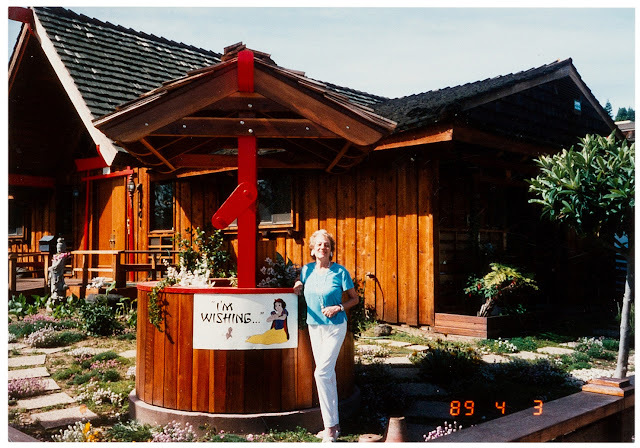 Even her telephone answering machine was set with her recording of I'm Wishing. 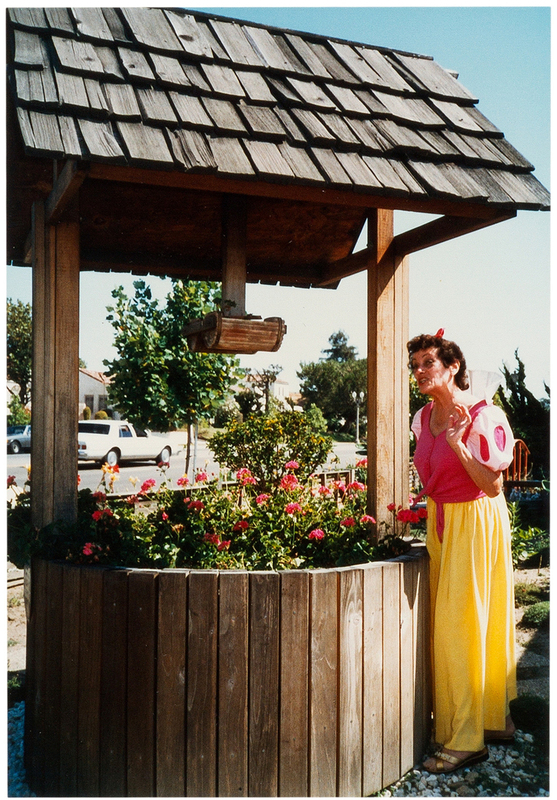 Snow White researchers and authors Brian Sibley and Richard Holliss visit Adriana outside her home in 1988. 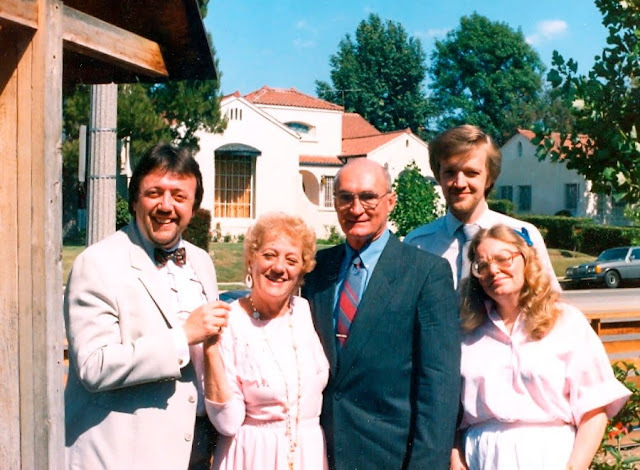 Pictured (L-R): Brian Sibley, Adriana, her then-partner Florian, and Richard and Christine Holliss. Photo shot by long-time Snow White buff Muir Hewitt. 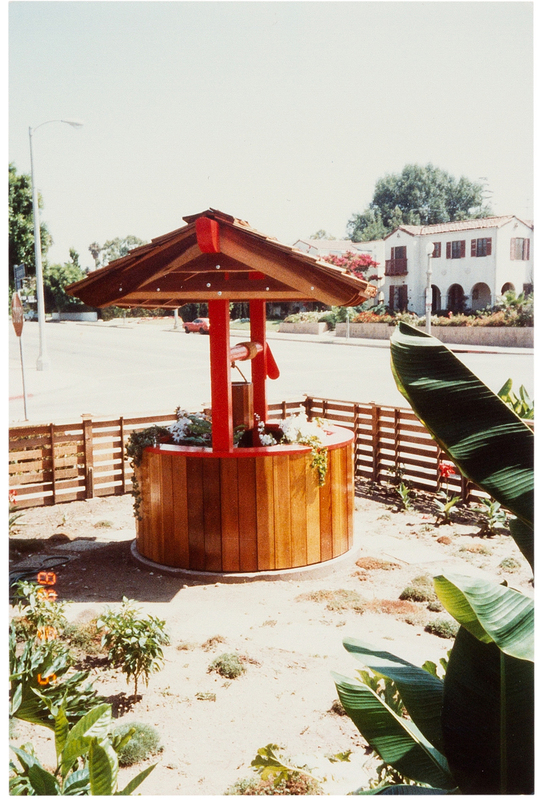 Image via Brian Sibley's flickr. Used with permission. 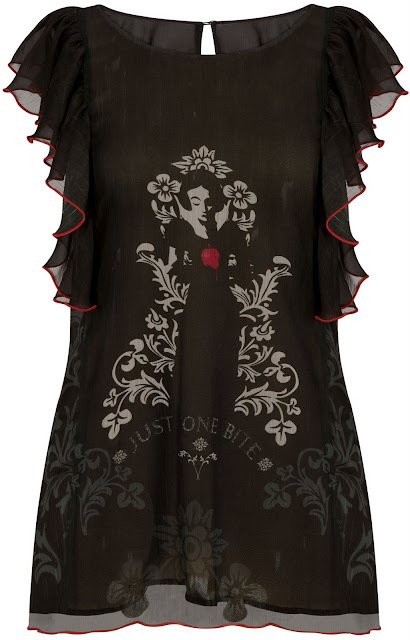 Additional images from Adriana's personal collection via Heritage Auctions. 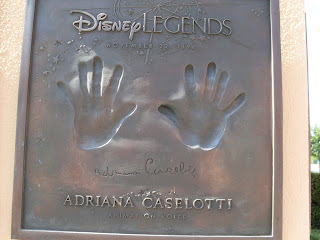 Honored as a Disney Legend in 1994, Adriana was invited to leave her handprints in cement during the ceremony. 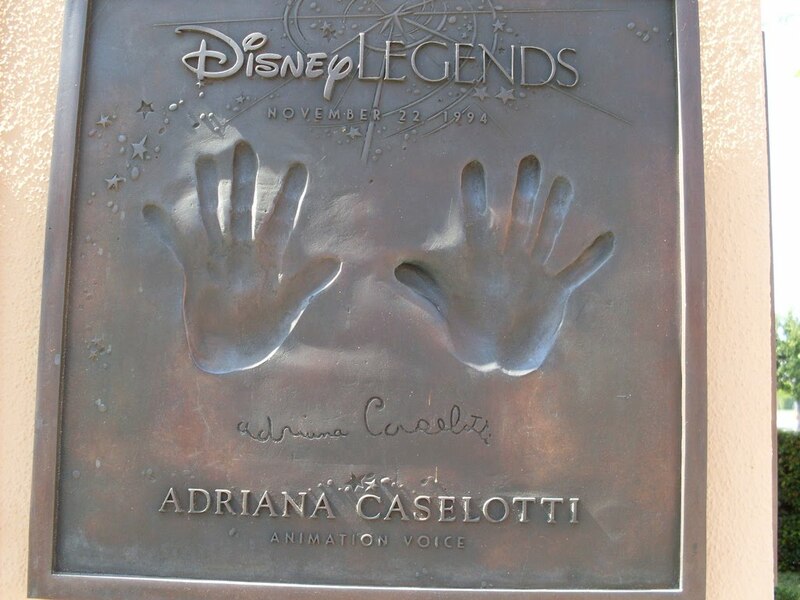 Later a bronze cast would be created and the plaque put on display at the Disney Legends Plaza (dedicated October 16, 1998) at the Walt Disney Studios in Burbank. 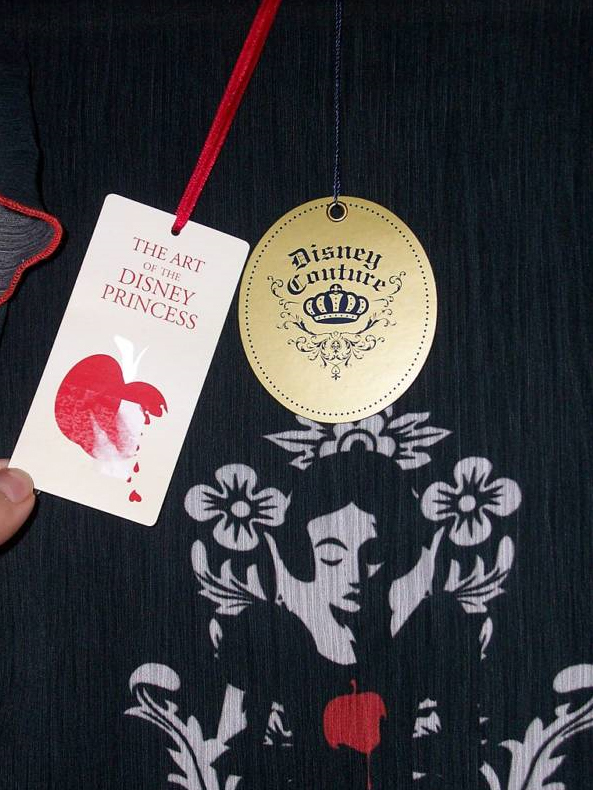 Walt Disney sought to touch the childlike nature in his audiences. Adriana was the true embodiment of this and the perfect choice for the role of Snow White. In 1995, she told a reporter, "I know that my voice will never die." She was so right. 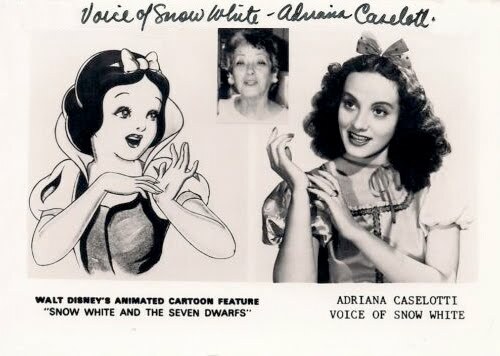 Adriana Caselotti passed away on January 19th, 1997 at the age of 80. Yet her legacy will live on.